Mush with 10-year old David Salmon and his pet ermine through Gwich'in Athabascan traditional life. In the 1920s, an epidemic forced David, today's First Traditional Chief of the Interior, and his father, to leave their village and trap for eighteen years in No Man's Land. The fur-bearing animals (wolverine, fox, ermine, marten, lynx, and wolf) of Alaska were their daily and closest companions. 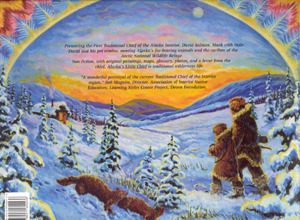 Alaskas Little Chief - Written by Judy Ferguson; illustrated by Nikola Kocic; published by Glas. Alaska's Little Chief is the Athabascan peoples presentation of traditional life. Perfect for the new Alaska state history school requirement, ALC is Alaskas history, geography and culture in a vivid color palette, told by a living shepherd of his people, Rev Chief Dr. David Salmon. The book is recommended for ages 4 and up. 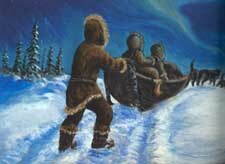 Alaska's Little Chief is non-fiction, painted in a Van Gogh - Alaska style. The book is made up of thirty-six pages with illustrated maps, glossary and epilogue. Set near today's Arctic National Wildlife Refuge, Alaska's Little Chief is more than a children's book, it is an experience of traditional wilderness life. Read a review of Secret Door and Little Chief by Capitol City Weekly (Juneau) editor Christina Holmgren. 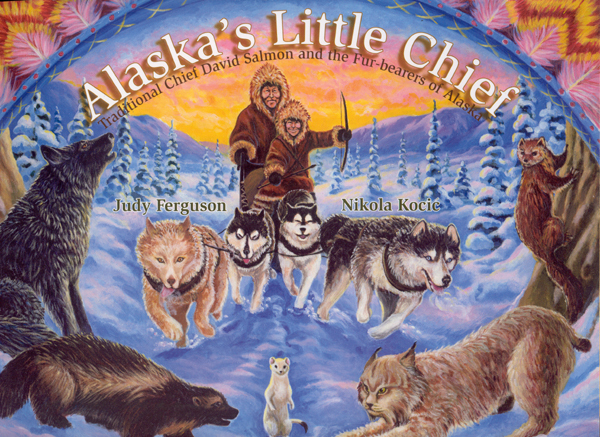 Alaskas Little Chief and Alaskas Secret Door are non-fiction Alaskana childrens books, presenting living mentors: First Traditional Chief of Tanana Chiefs Conference, David Salmon as well as Emmitt Peters, record-setter of the 1975 Iditarod Trail Sled Dog Race. 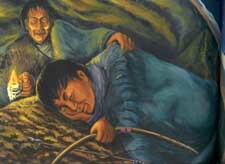 In October 2005, the response to Alaska's Little Chief and Alaska's Secret Door at Alaska Federation of Natives (AFN) convention was overwhelming, confirming that Alaskas Little Chief and Alaskas Secret Door fill a gap: portraits of Native elder personal sagas, windows of our unique heritage. Unusual for a childrens book, ALC and ASD include maps, bi-lingual glossaries and a full letter from Chief David Salmon. Through dynamic, colorful paintings of living heroes, Native and non-Native children are swept off the road system and immersed into the vast majority of Alaska where most will never go: the Bush where the river is the only road. As a bonus to educators, a complimentary CD, power-point presentation of Rev Chief Dr. David Salmon, master tool maker living near the Arctic National Wildlife Refuge, is offered. A field trip to Chief Salmons tools on display at Alaska Native Heritage Center and Doyon may complete a unit for the new Alaska history requirement and help observe Alaska Native Heritage month during November. " Judy Ferguson is also available to schools to describe working with a living chief in the creation of Alaskas Little Chief, a story of a boy and his bow and arrow." ISBN: 978-0-9716044-3-8; distributed by Voice of Alaska Publishing and by News Group.